Good value, excellent quality 10x10 ft/ 3x3 m square sil tarp. Ideal for car campers, backpackers who don’t mind trading a little more weight for greater coverage and durability, hammockers who want lots of coverage, or anyone else in need of a highly configurable, durable tarp with lots of webbing loop tie-outs (19 of them!). 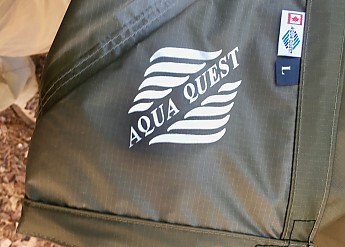 Aqua Quest is a company that has been making waterproof gear since 1994. 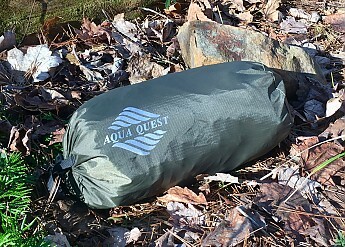 The company bills itself as “The World Leader in Waterproof.” I had heard of their tarps in bushcrafting and tarp camping circles, so I was delighted to have the chance to test and review the Aqua Quest Safari Sil Tarp--Square for Trailspace. 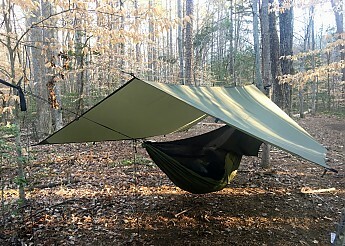 For the sake of simplicity, hereafter I’ll call it this tarp the “Safari Square” in this review. The company’s web site indicates their location in the Pacific Northwest, and the maker’s tag on the tarp indicates the tarp was "Designed and Licensed in Canada." The tarps themselves are made in Taiwan according to the plastic bag in which the tarp arrived. Within that plastic bag, the Safari Square arrives in a nylon stuff sack. The sample I received for testing did not come with any cordage or stakes, although Aqua Quest does offer their tarps in various “kits” that include 4, 6, or 8 webbing straps and an equal number of aluminum tent stakes depending on the tarp size offered in the kit. The packed size of the Safari Square is relatively modest. In the stuff sack, it has a diameter of 5.5 in/ 14 cm and is roughly 12 in/ 30.5 cm. However, the compressible nature of the material means that in practice the tarp takes up significantly less space than these dimensions suggest. The stuff sack itself is of the same quality as the tarp. It is secured by a black cinch string with a cord lock. A grosgrain webbing loop is provided, too, allowing one to use it for leverage when stuffing the sack or as a means of attaching the sack to other gear. The stuff sack weighs .5 oz/ 14 g.
That coating allows the tarp to be rated at 20,000 mm hydrostatic resistance, a nifty data point that means the tarp can handle heavy rain, wet snow, and high pressure (or, in laboratory testing, imagine the equivalent of a 1 ft x 1 ft square tube sealed on one end with the tarp fabric and then water-filled to a height 65 feet before the water would begin to seep through). 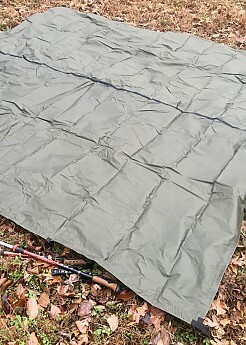 The Safari Square is also the middle size of tarp that Aqua Quest offers. All series come in a medium (10 ft x 7 ft/ 3 m x 2.1 m) and large size (13 ft x 10 ft/ 4m x 3m); the Guide Series also offers a XL (20 ft x 13 ft/ 6.1 m x 4 m). The Safari Square comes in olive drab (the lighter Guide Series come in a brighter green while the heavier Defender Series come in camouflage). 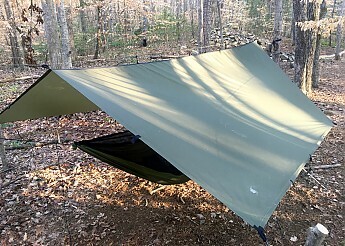 The listed sizing (as with other tarps I own from various manufacturers) is a nominal one, evidently representing the size of the fabric prior to finishing: the finished tarp is closer to 9 ft 6 in/ 2.9 m.
Seams are heat-sealed, which in the case of the Safari Square means the center seam (which is also reinforced with grosgrain webbing on the exterior to support ridgeline tie-outs) and the hypotenuse sides of corner reinforcement triangles that give the tarp exceptionally stout corners. These seams are also reinforced, in places double-stitched. 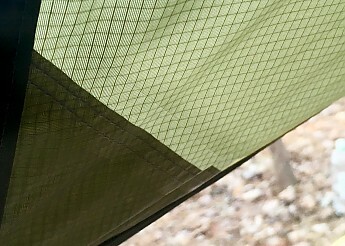 The edges have been neatly rolled under, spread to about .5 in/ 1.3 cm wide, and stitched flat, providing a neat and strong perimeter to the Safari Square and a secure base for the tarp’s numerous webbing loops for tie-outs. How numerous are these webbing loops? Nineteen in number: there are the usual four for corner tie-outs, but Aqua Quest supplies a generous three additional loops between each of the four corners for a perimeter total of sixteen. The final three are attached to the grosgrain-reinforced center line (ridgeline) of the tarp. 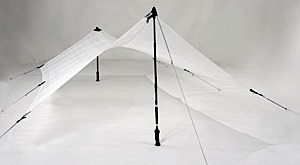 These allow one to run an external ridgeline for a basic A-frame tarp set-up, preventing any concerns that might arise from an internal ridgeline abrading the inside of the tarp during windy conditions. 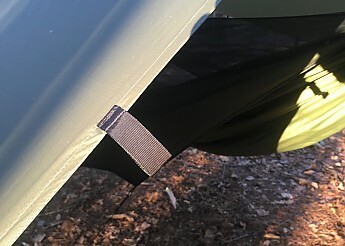 Two other webbing loops have been thoughtfully provided on the interior of the tarp at each end of the center line; these allow one to run a cord between the two for use as an improvised gear loft, clothesline, or whatever other use one can imagine. The materials, craftsmanship, and fit and finish of the Safari Square are all excellent. The 70d fabric feels substantial in the hand, not something that will yield to the first powerful wind or ragged edge it might encounter. The strong grosgrain webbing loops provide a superior choice to rip-susceptible grommets which—should they tear—can be mended with needle and thread in the field. 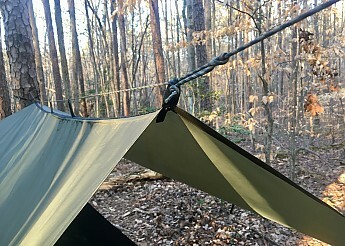 I tested the tarp on five trips over a period of months in a wide variety of weather conditions in the Central Piedmont region of North Carolina, several times in the Birkhead Mountains Wilderness. In fair weather, the tarp serves as a precaution or a shade device, and I found myself loving the substantial area under roof. 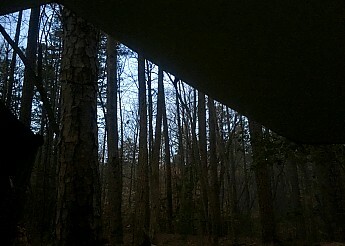 In my hammock, for instance, I could pitch the tarp high, allowing me protection from a chance shower while also enabling me to enjoy the dawn stealing through the woods from the comfort of my hammock. Such a setup also encourages excellent ventilation. I had few issues with condensation on the interior of the tarp, though I did tend to avoid meadows, low-lying areas, moist ground or the like when choosing a setup spot and camped in breezy conditions. I appreciated the Safari Square more when the weather took a turn for the worse. One especially daunting trip found me setting up in what appeared to be a protected area, but a sudden front pushed in with gusting winds of 35 mph/ 56 kmh. This was the only time I really felt any need to secure more than the ridgeline and four corners, so I added additional lines in the middle of each side. Nevertheless, I was able to set up the tarp in these high winds and secure it. 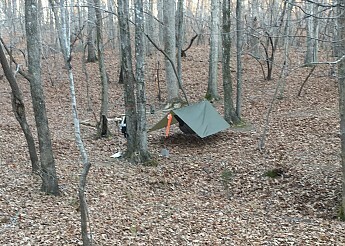 When that front moved in, I set up the tarp low to the ground, barely above the hammock I was using. The extra tie-outs secured the hammock well, and while the fabric rippled and billowed a bit as the wind gusts shifted about, all held with no evidence of stress to the fabric. The material is stout, but it is also flexible, and this obviously helps to preserve the tarp’s integrity in more extreme conditions. I also found there to be no difference in the fabric’s integrity over the range of temperatures I experienced during testing,from upper 20s to mid-60s F/ -2 C to 19 C. At low temps, the material seemed just as flexible and resilient as at higher ones. 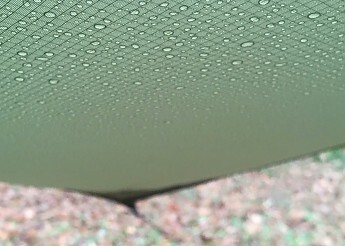 Initially stymied in my testing by months of drought, I eventually began to be able to test the tarp in rain, from light drizzles to steady downpours. The Safari Square lived up to its waterproof hype. Water beads nicely on its surface, and I never found myself subject to misting or drips during rain. Thus, the 20,000 mm hydrostatic resistance rating can provide considerable peace of mind to the camper. Having camped before under lesser products, this dry factor was much appreciated! Sag was not particularly a factor. The tarp did sag a bit over time during use, likely due to a combination of wind, dynamic lines, and fabric stretch, but the sag I noticed was in line with or perhaps less than other non-catenary cut sil tarps I’ve used. Unlike some lighter weight fabrics I’ve used, the 70 denier fabric also held up to the sun when I left the tarp pitched for multiple days—no discoloration or changing of texture was present despite repeated exposure to bright sun. 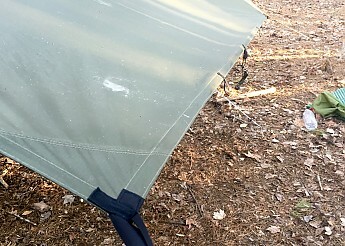 Ultimately, the Aqua Quest Safari Sil Tarp--Square proved to be a well made and reliable shelter. It is capable of being configured in many ways, from tent-like encompassing enclosures to airy canopy-style roofs, a fact that is supported by the generous nineteen webbing loops provided for tie-outs. 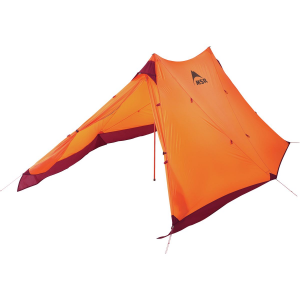 Indeed, part of the appeal of any tarp is its relatively low weight (in comparison to a double-wall tent, for instance) and its flexibility of setup. The nineteen tie-outs encourage experimentation with set-ups,and I confess I happily squandered an afternoon trying out different shelters, though for earnest testing in inclement weather, I stuck to the tried and true A-frame set-up. 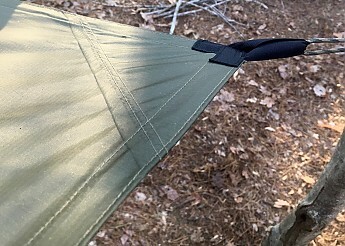 Note: For the novice, a good introduction to tarps and related issues is found in this Trailspace post, “A Beginner’s Guide to Tarps,” and subsequent comments. For 60+ pages of tarp talk that includes math as well as practical and even theoretical tarp configurations, see Australian David B. Macpherson’s treatise on the subject. 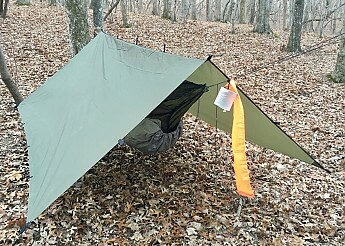 Hammockers, see Derek Hansen’s excellent post and illustrations explaining a square tarp’s versatility. What about price? The MSRP is USD $129.95, but it can be found for USD $30 less online. In my estimation, this price is reasonable for a tarp of this quality. When I researched commensurate tarps from some of Aqua Quest’s closest competitors, I found that the competitors’ tarps seemed to be lacking in some of the quality details that are present on the Aqua Quest tarps (like Aqua Quest’s reinforced corner sections). 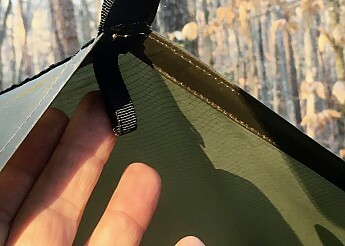 To me, such details help justify a slightly higher price point than other tarps in this price range; they reflect more careful designing and represent the promise of greater durability. Note: I alluded to online prices; curiously, online stores also seem to offer different color options than what appear on the Aqua Quest web site. Who might find the Safari Square a good option for shelter? 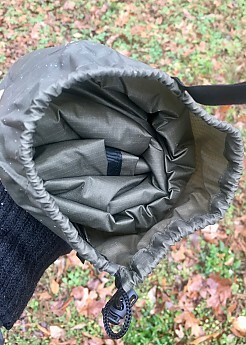 I would say it would suit a wide range of people seeking a sil tarp who don’t mind carrying a little more weight as a tradeoff for greater durability or who want either the greater coverage of this tarp’s size or the flexibility of a square tarp’s many configurations. It provides a great option for the car camper who wants a tarp over a picnic table or outdoor kitchen. It offers a robust shelter for ground campers who relish the unparalleled access to nature that a tarp shelter provides. 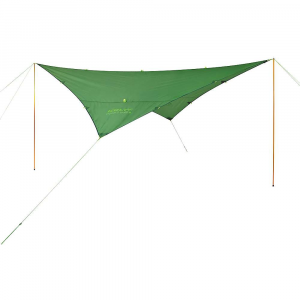 It offers an excellent option for hammockers who want a little extra cover to handle a wide range of weather conditions. Overall, then, the quality design, materials, and manufacturing make for a product that inspires confidence in its capabilities and demonstrates performance in its use. 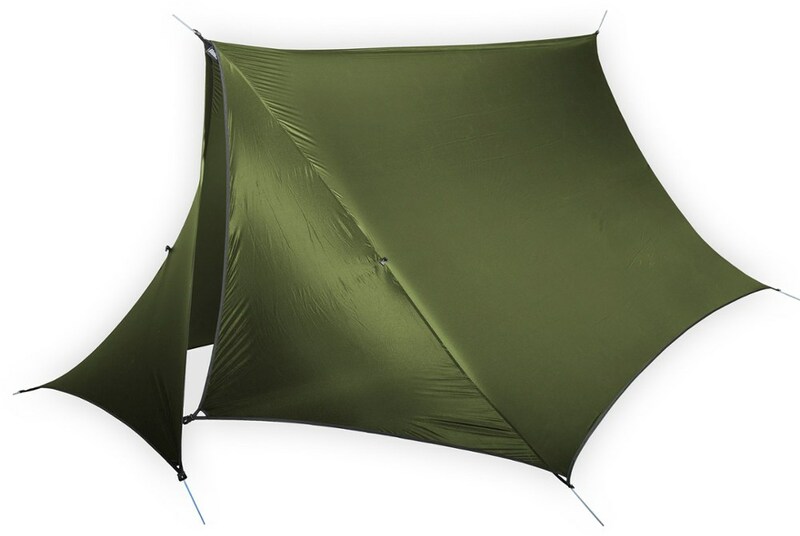 The price seems reasonable for its price range, a worthy investment for one intent on tarp camping. 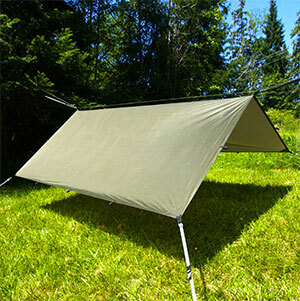 If a durable 10x10 ft/ 3x3 m tarp is in your future, I recommend considering the Aqua Quest Safari Sil Tarp--Square. Boy, that coverage looks really appealing. Might be worth the trade off in weight! G00SE, it's positively luxurious to have the space, particularly when it rains. It does pack down well, so it's really a question of weight, as you noted. The Guide Series 10x10 is almost a half pound lighter than the Safari, although my research suggests that it does have lighter weight build features, too. Great review and pictures, Bentbrook! Thanks for reviewing this product and brand that many may not know about. This tarp is fantastic. 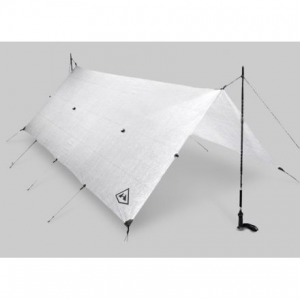 Very well made and has a ton of tie outs, a lightweight tarp. Stitching is top notch. Rained for four days and never saw a drop. 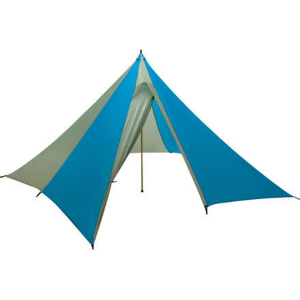 The Aqua Quest Safari Sil Tarp Square is not available from the stores we monitor.